Several jurisdictions have set targets for particular aspects of residential development and track progress toward achieving them. 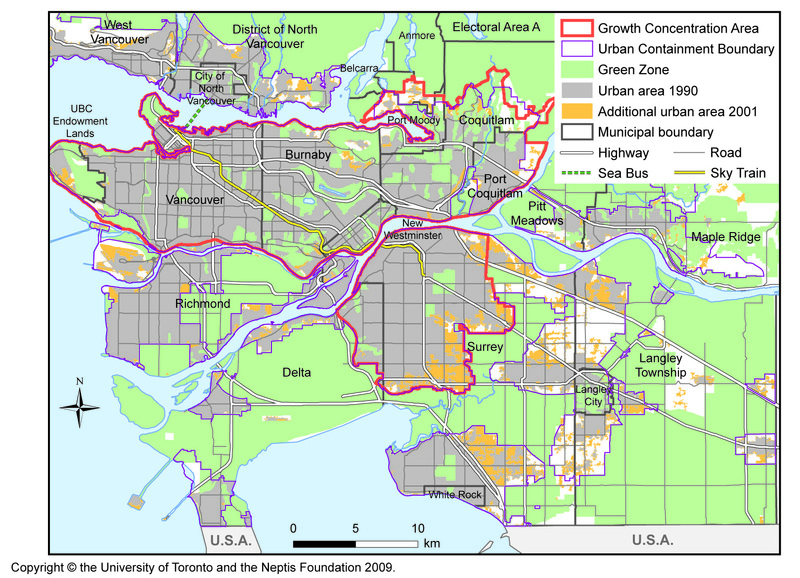 Vancouver, the U.K., and Sydney all document the location of residential development, but their methods and numbers do not resemble the approach to measuring intensification contained in the Growth Plan. The U.K. government monitors change in land use at the parcel level, nationwide. In any given year, the government knows how many dwelling units were created on previously developed land, wherever it is located. In 1998, the government set a target that every year up to 2008, 60% of new dwellings must be built on previously developed land. This target has been exceeded in each year since 2000, up to 80% in 2008 from 54% in 1994.21 This approach differs from that of the Ontario government, because the U.K. government counts the construction of dwelling units on previously developed land in rural as well as urban areas and ignores construction on undeveloped land within the urban fabric.22 The United Kingdom's National Land Use Database also tracks the location and quantity of land currently in use with potential for redevelopment. 19. Greater Vancouver Regional District, 2005 Annual Report: Livable Region Strategic Plan (Burnaby: GVRD, 2005) 3. 21. Ministry of Communities and Local Government (UK). Land Use Change Statistics (England) 2008 - provisional estimates (London: HMSO, 22 Oct. 2009). 22. In 1995, for example, while 53% of all new dwellings were built on previously developed land, almost 13% of these were in rural areas and just under 41% in urban areas. Redevelopment of mineral, landfill, and defence sites in rural areas counts, even if they are located in open countryside. See D. Adams and C. Watkins, Greenfields, Brownfields, and Housing Development (London: Blackwell, 2002) 213. 23. City of Cities: Planning for Sydney's Future (Sydney: Department of Infrastructure, Planning and Natural Resources, December 2005) 10; correspondence with Dr. Patrick Troy, Australian National University. 24. Correspondence with Bob Meyer, advisor to the Sydney Metropolitan Strategy. 25. City of Cities: Planning for Sydney's Future (Sydney: Department of Infrastructure, Planning and Natural Resources, December 2005) 133.